The Double Headed Eagle, the symbol of the Late Byzantine Empire, speaks eloquently to the worldview of the Byzantines, whose Empire looked both to the East and to the West, but never wasor isreally part of either. At its apogee, the Byzantine Empire was the highest civilization in Europethe Center. 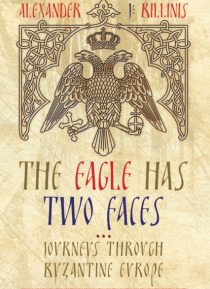 This Double Headed Eagle is cherished by the Balkan Orthodox successors to Byzantium, and versions… of it grace the national flags of Serbia, Montenegro, and even Albania. Encroached upon by both the Muslim East and the Catholic West, the Byzantine Eagle succumbed, only to emerge, in a state of arrested development, after several hundred years of Turkish or Western Catholic rule. This stunted progression emerges time and again in the civic culture, architecture, economics, and politics of the region, and has direct relevance on political and economic issues today, including Greeces present financial malaise, and the breakup of Yugoslavia in the 1990s. Traveling through this Ex-Byzantine zone, Billinis offers history, architecture, personal experiences, and numerous anecdotes to expound on key central themes. First, that the Balkan Orthodox nations form a common culture and virtual commonwealth, while still maintaining ethnic, geographical, and linguistic diversity. Without understanding this common Byzantine base, it is impossible to appreciate and to understand the region. Second, the common experience of Turkish rule, while preserving Byzantine culture and insulating the Orthodox religion from Catholic encroachment, did so by cutting off Byzantine Europe from economic, political, cultural, and civic development in progress in Western Europe. The states that emerged from this condition wereand areill prepared to contribute and to compete in modern Europe, and in a globalized world. Finally, throughout, there is a sense that history, rather than linear, runs in a circular form, and that history once again encroaches on the lands of the Double Headed Eagle.